This delightfully chunky star is made from 6mm thick ply and stands aprox. 8cm high. 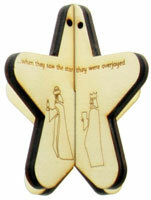 The two halves simply slot together and are etched with a picture of the 3 Kings and the verse "
when they saw the star they were overjoyed" to remind children of why they see the symbol so much over the Christmas period. The star can either be stood or ribbon can be treaded through the holes at the top to make a Christmas tree decoration. Part of our 10 for a tenner range.